Last month I wrote about why Addie had never worn a bikini, and why I wouldn’t be buying her one anytime soon on babble. Commenters who didn’t know my family or me at all began predicting a future where Addie goes to school with mini skirts and halter tops shoved into the bottom of her bag so she could change in the bathroom. There were assumptions that I was controlling her, not giving her any choice and that all her clothing choices are far more Laura Ingalls and far less…well…Addie. There was a time I picked out every outfit Addie wore, it was grand fun, just like dressing a doll. Then suddenly she developed opinions and began dressing herself. Clearly I lost all control with her wardrobe and ran with it. *shrugs* It’s her thing, these crazy outfits she puts together. So when comment after comment rolled in about what horrible parenting decisions I was making I was able to take a deep breath and know I was doing okay. I may buy Addie’s clothes, but the execution? It’s all her. Modesty is wildly important to me, but I don’t really care how she gets there as long as she does. If it’s layering seven different floral patterned and lace trimmed pieces with red cowgirl boots? So be it. I’ve started watching Project Runway with her, we’ve had the same favorites from the very beginning, Austin Scarlett and Mondo. I didn’t have any influence on her decision, we both like what we like. She loves how weird and quirky some of the outfits can get and doesn’t understand why I don’t leave the house swathed in tiny blinking LED lights. On Friday she decided to host her own runway show and demanded that I photograph the event. She then made me follow her around outside as she used our driveway as an (sub)urban runway. I realize she’s wearing my boots, but you guys…LOOK WHAT HAPPENED. SHE GOT ALL BIG AND STUFF. If you want to wear tutus on your head for the rest of your life? SO BE IT. Heck, if you want to wear tutus period for the rest of your life, so be it. I guess she’s still little in my head because she still loves clothes that glitter, skirts that twirl, and shoes with flair. May those be loves that never ever leave her. When I was given the topic of the things kids wear, I almost had too much material. I’m so grateful to partner with Hallmark in 2012 on their “Life is a Special Occasion” campaign again and I thank them tremendously for believing in my family, Addie’s fashion choices, me, and for sponsoring this post. My daughter is just starting with the opinions on what she wears, and spends her days at home wearing a cheerleader outfit over a shiny polyester Halloween costume skirt. I haven’t let her leave the house in that ensemble yet, but she’s starting to wear me down. @Jessie, Addie is seven and still spends her days within the house dressed in costume. I love serious addy. She’s obviously fierce. @designhermomma, She can pull of fierce way better than I can, that’s for sure. And she still wears pink..she has that going for her girl! Miss Dallas is into the eye rolling and won’t wear solid pink…purple is still okay though..and peace signs…peace signs are all the raaaage! Girls…I love em! I applaud you for teaching your daughter modesty from a very early age. My daughters are in high school and dress appropriately for young ladies even when all those girls around them are showing too much! @Melissa, Thank you, and I have to believe I’m doing something right because what’s wrong with instilling a few morals here and there? The fact that she’s such a confident, creative individual means you’re doing it right. Good job, mama. @Jen L., Oh gosh, thank you. I figure if this phase ever mysteriously passes then I’ll know I have a problem. That 3rd to last outfit- I WOULD WEAR. Love it. PS Ivy watched Project Runway with me in bed a few weeks ago and it was the best. @Adventures In Babywearing, I’m thinking of having Addie dress me for the week, see what happens. 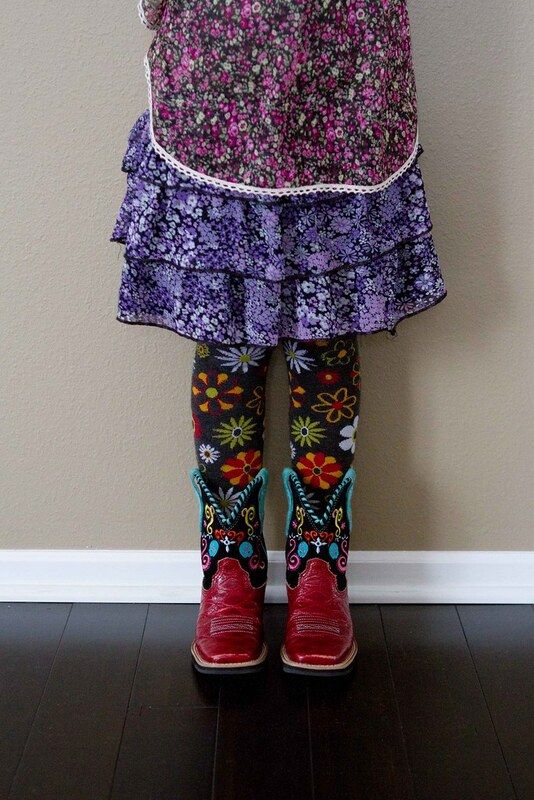 I love how she is expressing herself this way – and her cowboy boots rock! My son went through a stage where he just wore red clothes…made shopping easier! @HeidiLee, Addie’s into monochromatics. ALL BLUE! ALL PINK! ALL PURPLE! And it totally works for her. Sophia firmly believes that the more colors (or sparkles) involved in an outfit the better. Especially when topped off with fuzzy purple boots. @Sunshine, Boots are like fashion frosting. Addie and my Claire would be BFF if we lived next door. @Angie [A Whole Lot of Nothing], Let’s make that happen, for at least a day. @SarahInMI, Oh I’m so team Mondo, but he seems so sad this season, no? just love your blog, casey & you! my gracie is 4 & has been going through several outfits a day- driving me nuts when it’s laundry time. but i love the self-expression. love your parenting philosophies – i’ve learned lots from you in many areas of life. thank you for your openness & sharing. @sara, Oh thank you Sara, we finally had to make a ONE OUTFIT A DAY rule but dressups are excused as long as they are put away. You just can’t argue with that. WHEN did they grow up on us??? @Rachel – A Southern Fairytale, NO KIDDING. I see princess and think ADDIE IS SO MUCH SMALLER THAN HER BUT NOOOOO!!!! I used to wear skirts on my head as a kid, too. Sadly, there are no pictures to chronicle this stage in my life. It wasn’t a fashion thing for me, though. I just wanted to see what it was like to have long hair since my mom wouldn’t let me. Which is probably why now I grow it to ridiculous lengths until I can’t stand it, chop it off to donate, and do the whole thing over again. @Katie, I’m pretty sure it’s the long hair thing for Addie too. She’d probably live in wigs if we’d let her. Another favorite of hers? Pom poms as ponytails. The photos of Addie wearing what she chose looks very, very similar to things that Brandon selects for the girls. And, I think he would go with that logic that it matches because they are all flowers. I think he likes my expression when I see them dressed and how I try to change them on the sly. I wore tutus on my head all the time when I was little. @Ohh Betsy!, Oh Brandon, Cody tried to dress her to, or the baby…it never ends (fashionably) well. @Casey, Does Cody do hair too? Brandon’s pigtails are seriously so, um…asymmetrical. @Ohh Betsy!, Cody doesn’t touch Addie’s hair and Vivi always ends up looking like a boy. She is so creative and spunky! I love her! She is a true artist! I definitely agree with letting her inspire your wardrobe. I would love to see what she comes up with. It might be a fun post. @Bea_OT, Problem is most of my fun stuff is either dry clean only or from before two kids. There will always be folks who criticize parents who set boundaries for their kids, whatever they may be. Don’t let it get to you! Modesty is unappreciated by most, but still important. As for letting Addie be Addie, it seems to me you’re doing a great job at that! @Rebekah, It’s unappreciated until people realize just how important it is. Thanks. @Rach81, Goodwill and second hand shops are the best place to find little random colorful pieces. And the boots? Super duper sale on Zulily. @Rach81, Wait! My boots…the black ones? OH! Those are Earthies, a new spin off of Earth Footwear, super comfy for boots of that height. I always figure people are asking about Addie’s boots. @Beyond Normal Mom, Addie has never met a tutu she didn’t like. I have never met a pair of black stretchy pants *I* didn’t like. @Chrysta, My friend with 5 boys just got the “it’s a girl” utlrasound. I got a couple of “it’s a girl” ultrasounds with my last boy, had the closet stocked with pink. And then, at 36 weeks, he showed his true colors. I had a new doc and he decided to take a look. I saw the jewels on the screen and knew even before the doc said, “…and what did they tell you you were having?” I admit it, I went home and cried, but he was my salvation during my last bad bout with depression, so it was totally meant to be. Also, I vote wholeheartedly for the week of Addie choosing your outfits. Fully documented and posted for all the world to see, of course. Hey, I was going to comment and ask about your boots because they are just what I’ve been looking for all winter. Of course now that it’s unlikely to be black suede boot weather, I see this! But then I saw you said they were from Zulily. I thought they only had kids clothes? Zulily totally has mom stuff too, I got a red leather Kenneth Cole coat for $40 DUDE. I love her style its all her own. My oldest never matches granted I have boys. So its more just strips with orange pants. I can’t get my youngest to wear clothes at the moment. @saramd, Little ones are always nudists. I never wear glitter, very few of my skirt twirl, but ALL of my shoes have flair. But they wear it all beautifully. @Becky, And that’s what matters. Addie is super stylish. She layers better than I can at 32! I think the fashion battle is not one I’m going to fight when my babina gets that age. If she wants to look like a super hero so be it. I will put my foot down on anything that is not suitable for a child though. Team Modesty! @Kristen, Dude, I can’t dress myself to save my life. I hope it’s a skill Addie hangs onto. I am no fashionista by any means and sometimes I am grateful to have boys because of that. 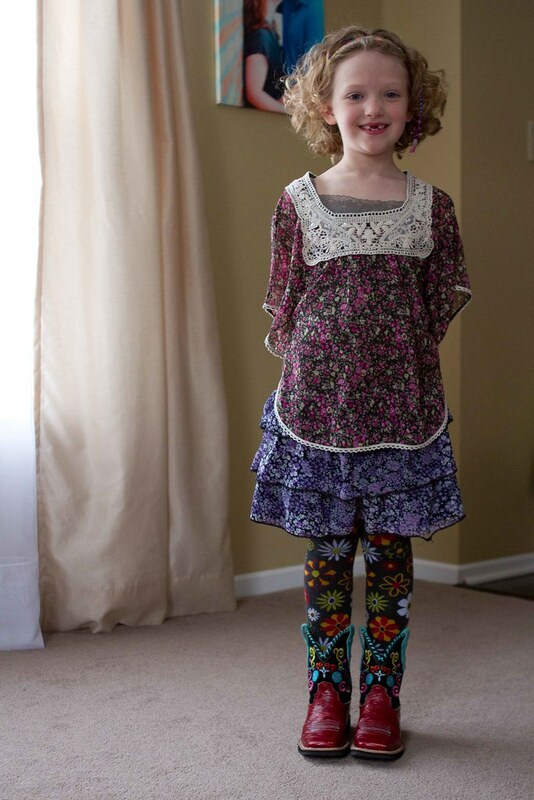 That said, I just love Addie’s sense of style and the fact that you allow her to dress how she feels comfortable. It is so vital to teach little girls to accept themselves, no matter what. The beginnings of great self-esteem. Kudos, Casey! Nothing against your outfit choices because it is exactly how I dressed my girls at that age, but I gotta say I love her wacky sense of style better than anything I could have come up with. Fabulous! Modesty is big in our house too. Standing out while standing up for what you know is right is exactly what kind of mothering we need right now. @April, Yeah, makes my outfit choices look so boooring. @Barb @ getupandplay, And they say there’s nothing to be learned from reality TV. Modest is hottest…stand your ground! I think you’re doing great! She’s adorable and seems like a happy little girl. 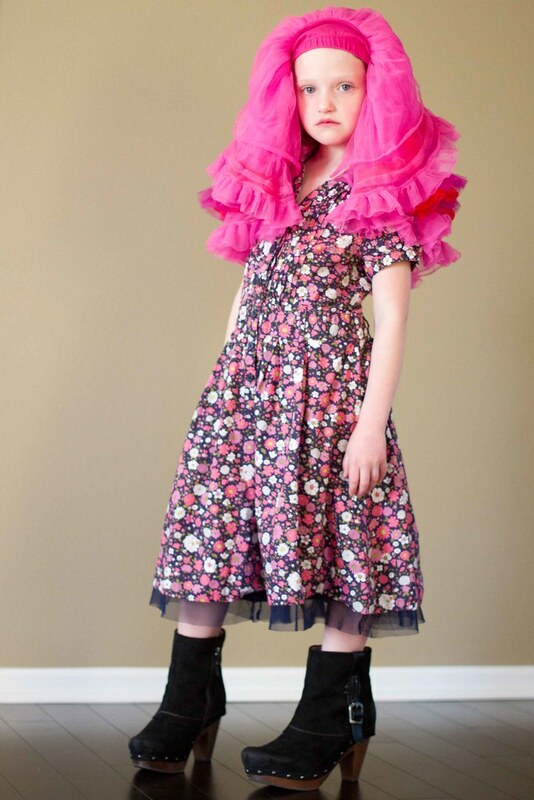 I have a six year old with a wacky style sense too…so fun! @Natalie, I totally agree and thank you. I’m all for teaching girls modesty (or, more importantly to me, self-respect and confidence the right way), but I think trying to convince them all to stop tanning would make me happier. I can’t imagine what my skin would be like if I had tanned at 12. Ugh. @Katie, I’ve never EVER stepped a toe into a tanning bed. Ever. We have a family history of skin cancer so it won’t really be an option for Addie either. People called you a bad parent for not letting your seven-year-old wear a bikini?! Seriously?! Modesty in little girls is VERY important, no matter what religion you follow! Sorry, not awake yet; I also wanted to say that I love her outfits! @Liz, Yeah. Well. People can find problems with anything, including virtue and puppies. I think the best part of having a daughter is dressing them up! Oh, I so missed doing that to my only girl. I love her style and hope she keeps on with it forever. Love love love it. I’v been following on babble for a while and am now exploring your site. Good for you for teaching her modesty! Your girls are really lovely, and it’s so obvious that you’re crazy about them keep up the good work!